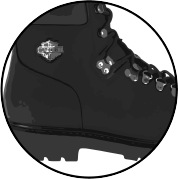 As if you need a reason to buy a new badass pair of boots, here are a few of the benefits of wearing motorcycle boots that are specifically built for the ride. For uncompromising dependability that is time-tested and user-approved, Goodyear welt construction adds lasting strength and durability for the long road ahead. 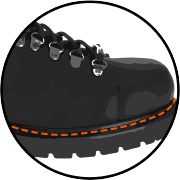 Rubber outsoles provide abrasion and vibration resistance for miles of asphalt, while offering slip resistance for when the weather turns wet or the garage floor gets oiled. Leather uppers offer exceptional durability as well as increased resistance to abrasions and water to help protect against all the dirt and debris the road throws your way. Built specifically for the ride, the H-D® collection of motorcycle boots not only provide all-day comfort, but are essential to help keep riders protected on the road. 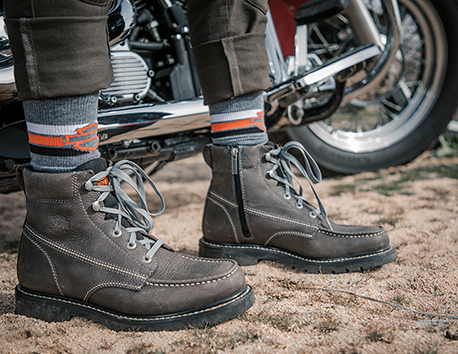 Motorcycle riding boots are designed to prevent exhaust burns, provide much-needed traction underfoot and grip at stops, and help battle Mother Nature and the various elements of the road. 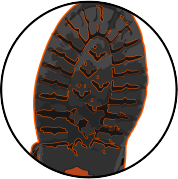 I would like to send out a huge thank you to the makers of Harley-Davidson® boots. I wrecked my Harley head on into another car. My left foot shattered the primary into millions of pieces, the chain attempted to take my foot. If I had not been wearing my boots I would have for sure lost my foot. This goes to show once more that your gear can save you. I am just thankful that your product saved my foot. THANKS!!!!! !